Energy is an important feedstock to the production of various fulfilling needs of consumers. But, the matter is that the sources of energy are how plays efficiently in bring of kinds of energies as outcome for various purposes due to characterised about natural contents. Though, the contribution of primary energy potential is always great from natural belonging activity like agriculture. So sufficient yields are possible to obtain as types of energy for consume. On the other hand, due to lack of technology in alternatives of primary energy for further and being lack awareness among farmers in such developing countries leads to misusing of such resources which supports to generate commercial energy to minimise over utilization of primary energy. This paper has been built with agricultural contribution to boost the production of commercial energy from renewable energy biomass which comes as agri-waste. This study has powered by secondary data from 2000 to 2020 (Expected year) and EAI and other sources were useful to collect required data. Picture and table presentation have brought for describe the collected data and concepts. Finally, concludes the paper along with scope of this study which meant the purpose of study made and effective recommendations.e. The first and major role of agriculture acts as a tool for the production of food and other primary goods. But, for the cooperation of nation's targets behalf of agricultural sector in food preparation, crops production and marketing must be enrich to contribute until the fulfillment of public needs . Sustainable Agriculture and Rural Development (SARD) aims to foster sustainable development in fisheries and forestry sectors, animal genetic resources, environmental quality on non-degrading with technical approaches and social acceptance for gyrate efficient performance and execute effective policies which supports to consider the alternative technical progress for satisfying needs of agricultural activities and further of the same. A set out of FAO perspective on the "Multifunctional Character of Agriculture and Land (MFCAL)" uphold that agricultural activity and pertained land-use are contributes directly to other, non-agricultural functions comprising social, environmental, economic and cultural goods and services the details of which are mentioned in Table 1. 1. Biomass is a stored fuel, and can provide energy. 1. Present-day biomass technology has a poor cost-effectiveness compared with most conventional energy. 2. Biomass is a flexible fuel which can be converted into solid, liquid or gaseous fuels. 2. The modern biomass technology is largely in industrialized countries, technology transfer for its exploitation in developing countries. 4. Fuel production, collection and supply are the social benefit in rural areas. 4. Biomass plantations may conflict and competitive one high quality land productive. 5. When development in wasteland restoration and rural economic development, biomass offers additional environmental, social and economic benefits in rural areas. 5. In fuel supply chain and ready market for energy output, robust and secure contracts must be in place. Table 1. Advantages and disadvantages of biomass . Plant and crop-related resources are performed as raw materials for variety of sectoral products to be produced, ranging from wood to manufacture, starches used in sticky purpose and vegetable oils used in paints and resins . Agriculture provides a key to economic sector by supplying all required energy materials from it like fossil fuels and others. Several industrialized countries take some efforts to enhance the use of plant and crop based renewable resources through technological developments. Energy is required for mechanization, water pumping, irrigation, fertilizer production, transport and food processing and storage in the agricultural field for put into practice. Awareness of the potential of bioenergy as an economic driver for rural development and new approach to agriculture is still lacks among public . The traditional energy among rural in developing countries have already rely on biomass from agricultural and forestry sources. So the farmers have gains extra income due to the trading of commercial energy such as wood fuels and charcoal etc. The development of modern bioenergy technologies in generation of electricity and other fuels are the major efforts of this study to enrich the production level of commercial energy by input of non-commercial energy comes from agri-field . Study focuses are the effective tool for production and maintenance of renewable energy and it provokes the producers to be done well. Therefore, as an inspiratory for Indian agriculture, biomass is applied as key energy to produce and boost commercial energy from agri-land. Some of prepared objectives have pointed below for build study further. • To know the biomass outcomes as sources of commercial energy. • To perceive the potential and production of various types of biomass to produce commercial energy. • For understand the manufacturing process of commercial energy from biomass combustion. Bioenergy System LLC has prepared report on "Assessment of Agriculture and Forest Biomass Resources in the Mid Portion of the Missssippi River Alluvial Valley". The preparation have been brought out the details of feedstock and land use for the production of biomass and alternative energy production from biomass with increasing economic components . Collected data shown with tabulation, graphical and diagrammatical presentation, and data collected from secondary sources for the period of 20 years from 1997 to 2007. Increased amount of crops biomass production found at 57.8 mm tons in 2007 and total agricultural process for residues production shows 1.3 mm per year in the region the details of which are mentioned in Table 2. Table 2. Amount of biomass availability in various States of India . Joshi et al. have made study on "Assessment of biomass potential and current status of Bio-fuels and Bio-energy production in India". The study builded with important concepts, background and current status of biomass in India. Especially, outcome of biomass that how it has been ruling as raw materials for various productive purposes along the potentity availing in India and bioenergy status also brought simultaneously . Tabulation and graphical expression have applied to identify the statistical fluctuation and secondary data collected from major sources such as Ministry of Petroleum and natural gas, Ministry of new and renewable energy, Waste-to energy research and technology council and Energy Alternative INDIA (EAI) for 2012-13. Finally, the study concluded with some recommendations on incentives and policy implication to be enhanced by the government. The production and consumption of biomass as energy sources have applied to many goods and services including agriculture, food security, and land use on rural development, sustainable forest management, bio-diversity conservation and mitigation of climate change. Moreover, most of rural people are rely on agricultural outcomes not only for food preparation but also to fulfill the energy requires of their household purposes the details of which you can see in Table 3. On the other hand, economic power and environmental are effective key for utilized energy and to vast consumption without future prospects . So the imbalance must be eradicate and enrich the awareness in making well society towards energy sustainability for upcoming posterity. The important note is that producing and distributing conventional energy are challenging one by new approaches such as privatization, decentralization, trade liberalization and globalization. Table 3. Current level of biomass production in India . Contribution of residues and wastes from forest and agriculture fields are the upcoming sources for supply energy to domestic people with access of adequate and affordable for socio-economic development. But, the product of biofuels determines the people's standard in the power of income and employment in preferring household energy for domestic purpose. Availability of Agricultural land has possibilities to cultivate kinds of crops and also equipped the types of renewable and non-renewable energies for various households and other purposes . So on the need of increasing trend of food production, large areas of deforested and degraded lands were have transited into agri-field and established biomass production with the estimates of up to 300 Mha. Other studies of agricultural cropland says that the developing countries shall be used the crop land at 40% only in 2025. But, crop and cash land are the important elements to determine the development of the nation. In 2004, country U.S has produced 1.6% of ethanol and among agricultural yields 0.3% of energy consumed out of total energy utility. On the other hand, by addition of ethanol production, biodiesel, wind, anaerobic digester and non-traditional biomass have brought as agricultural advances. The Biomass Research and Development Act 2000 has defined that 'any organic matter that is available on Renewable or recurring base', including agriculture crop and trees, wood and wooden wastes and residues, plants, grasses, fibers, animals wastes, municipal wastes and other waste materials. Biofuels are the liquid type which primarily supports the transport purpose and being produced from renewable energy biomass. Agricultural Crops such as, sugarcane and corn consist amount of sugar itself as a feedstock to support the production of energy equals to the competitors of principal energy electricity and fuels which is given as Figure 1. Figure 1. 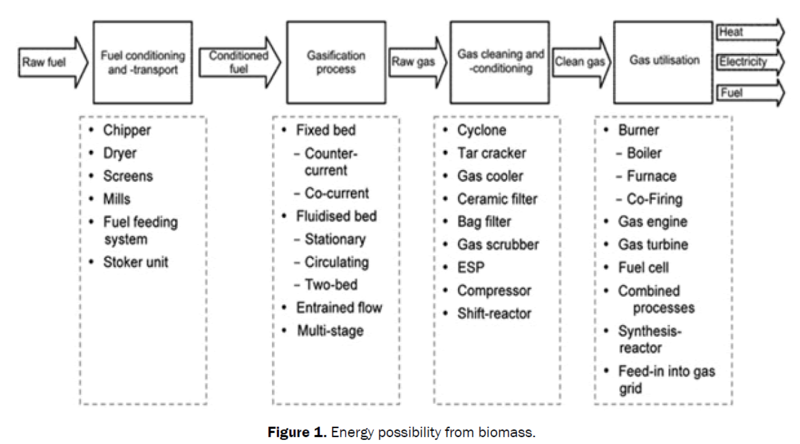 Energy possibility from biomass. The consumption of renewable energy has exposed less environmental impacts at domestic and abroad compared with technologies inserted fossil fuel consumption and distribution. But, it is availing domestically at all markets with limit price for feasible transaction to reach all economic sections of public. Though, the scientific progress on technology is being vast on renewable energy to make it well and comfortable to all in developing countries. For the productive extension of renewable energy like biomass, has to equipped by affordable investment as planting in agri-field where feasible to produce as two in one it meant crop for food and residues for energy . These efforts may bring changes on technology in cost-pricing system. Moreover, such renewable system able to produce electric power which cannot be stored by batteries for further needs. Hence, this operation has eliminated from the renewable system of biomass energy. But, very recent technology may empower the generating system. For the implementation of renewable energy operating system that requires the substantial less cost and practical application to consider the contribution and competition with conventional fuels . Affordable policies and effective institutions need to expose well performance and liberalize the prohibition in market entries to enrich the level of energy activities until reach the consumers comfortably. United States embedded biomass at 10 Gilowatt and as an installed capacity accumulated from forest, industry and agricultural residues were at 7 Gilowatt, 2.5 Gilowatt of Municipal solid wastes (MSW), 0.5 Gilowatt from other capacity like landfill gas production for the generation of electricity. The renewable energy biomass has possessed sufficient commercial energy itself to contribute different purpose of the advancing consumers. But, practically, it's empower have consumed before it become matured at energy expose due to increasing demand of this in various activities of sectors. However, presumption on advantages and disadvantages of biomass enunciate its quality and quantity to further performance shall be done by technologies . There is lack of efficiency to manage the biomass as commercial and developmental aspects. But, the application of clean development mechanism and least cost effectiveness may take it to balance in favour of increasing production and potentiality of biomass by considering the strength between energy and agriculture the details of which are mentioned in Table 4. Table 4. Biomass potential in India. Production of biomass determines the types of plants and organic farm generates minimum amount of biomass in the agricultural field. Thereby, farmers have been involves in an indirect way to gain maximum output in the production of the same. But, many of them getting maximum crop's as outcome with lack of knowledge in alternative energy production namely heat, power or fuels from biomass. According to government policies laid on pollution reduction and distribution of energy to all suffiently, such activities need to ensure as technology improved on energy conservation and preservation along with incentives for alternative energy like heat, power or fuels . So there will be sufficiency in energy consumption for fuels to cars and tractors in agriculture, heats and power for households and building purposes. For the production of biomass, Indian government handling three types of approaches including Grid and off-grid connected biomass power plant in various segments and has been produced 565 million ton biomass in a year and also 189 million ton of biomass have used for power production in India. 1. Grains and starch crops: Sugar cane, corn, wheat, sugar beets, industrial sweet potatoes, etc. 2. Agricultural residues: Corn Stover, wheat straw, rice straw, orchard pruning’s, etc. 3. Food waste: Waste produce, food processing waste, etc. 4. Forestry materials: Logging residues, forest thinning’s, etc. 5. Animal byproducts: Tallow, fish oil, manure, etc. 6. Energy crops: Switch grass, miscanthus, hybrid poplar, willow, algae, etc. 7. Urban and suburban wastes–Municipal Solid Wastes (MSW), lawn wastes, wastewater treatment sludge, urban wood wastes, disaster debris, trap grease, yellow grease, waste cooking oil, etc. As growing country like India contains precious resources supporting to framed targets by various sectors with effective policies laid by the government on the sight of Conservative and preservative tracks. Through the use of abundant natural resources, agricultural sector has playing as significant contributor for fulfill necessities to public by undertaking the calculus of economic factors based on segmentation of states. As on regional wise data that have found greatly in Uttar Pradesh at 12,628.20 while Meghalaya at 0.80 and crop productivity at million tons in a year. Rajasthan at 93.65 followed by biomass generation at 204.89 and its surplus at 35.53 in the same region. State Rajasthan has highly resulted at 4,595.00 potentially of biomass to equip power generation among others. The agricultural performance of everywhere has brought out biomass from crops abundantly knowingly or unknowingly. But, practically, due to lack of technology improvements and awareness on producing energy alternatively, have taking worst itself and defaulting further agricultural activities to minimize the needs for feedstock and maximizing demand on commercial energy like fuels and electricity . This study has point out two major causes for existing mentioned disputes therein. I. To reduce soil erosion: For continuous agricultural activities, fertile soil condition is most preferable for cultivate appropriate crops based on regional structure and cultures of the area. Thereby, emerge of deathlike of advanced ideas in this field, farmers almost leaves the organic wastes in the same places to reduce the soil erosion. This being casual problem in wet land and where rain falling more. So, there prevailing energy scars because of absence of alternative activities. II. Recycle nutrients back into the soil: On the other hand, maintenance of soil fertile is another significant obligation of farmers. As a thought of labors, where there this activities tries, there will be attain maximum yields. But, for reach secure and economic benefits from commercial energy, activities must be enhancing on alternative energy production and distribution. Many resources are in the process to economic development of India. But, most of them have taken agriculture field for various commercial production like biomass as renewable energy from agri-field has expose such commercial energy as outcomes of suitable crops. Among the number of biomass sources and systems for electricity generation, takes significance in electricity productivity and targeted to connect 6867 villages in 2011 thus, systems and sources all were shown lofty production compared with 2010-11 and 2011 result shows above. 1. The availability of Biomass is difficult to consider for whole year. 2. Availability of Biomass from agriculture can determine only after the harvesting period of 2-3 months in a year. Period may vary based on types of crop at matured. 3. After power project implications, Biomass price will be increases very fast. So, government tariff policy needs to revise for every annual. 4. Lack of mechanization in Indian Agriculture Sector. 6. Numbers of small and marginal farmers are high. As the renewable energy biomass performance for country's development, consists various types itself based on structure and economic strength of regions. Potential power of each type able to measure the efficiency to produce further commercial energy such as biodiesel and electric power. Measured the efficiency of biomass in the generation of power is given from agricultural field at 18728 great level compared with remain types. So the maintenance of agricultural fields equips the valuable crops for the production of commercial energy like electric power abundantly. There are many resources availing which spurs the generation of kinds of energy from natural and artificial contents. But, anticipation of energy production must be emerge from existing agricultural fields due to least cost of production, ease availability, two in activity (crop as food and biomass as energy) and feasible to enhance collection of energy by rural and economic backward regions where the supply of commercial energy optimise because of cost and inapplicable equipment’s using therein . Where the agricultural activities performing, there will be final products which determine husk and dregs and are the organic waste with lack of ideas to precede it to transit as useful alternative energy. Indeed, types of biomass, namely corn, wood chips, kinds of garbage and dregs of sugarcane are helpful to produce heat, biogas and electrical energy. Moreover, oil related crops supports to produce biofuels like biodiesel which promote the transportation. Heat energy is an energy emits from any combustion and it is effective tool for accomplish purpose like heating buildings, crop drying, dairy operations and industrial process. Though, there is no aims to produce heat energy because, where combustion prevails, automatically heat will be express for alternative purpose. But, while this is in the process, a bench of heat energy consumption also emerges. Biomass for the production of biodiesel is preferable one for transportation purpose especially, agricultural activities knows the significance of this. Hence, this process has intimates with chemical reactions in industry with efficiency to make quality fuel in safe way. It is an alternative fuel for vehicle's engines with addition of methanol or ethanol by alcohol. The chemical reaction which converts vegetable oil or animal fat to biodiesel is called "trans-esterification". Biofuel is the most pure and easiest availing fuels on the planet preferably from agri-field, they are classified into gas, liquid and solid that derived from biomass . If it is ease to produce with least cost of production, that can make rational people to be happy and produce it sufficiently to distribute due to biofuel is better than other forms of fuels like petrol or diesel which have manufactured by the great and popular oil manufacturing companies. Most of the diesel engines would work more efficiently and fuels are also very clean and environment friendly moreover, it can be a lot more efficient economic fuel can be used in kitchen and agricultural purpose. Biofuels also encourage the recycling process to be manufactured from waste products. In 2010, worldwide biofuel production attained 105 billion liters (28 billion gallons US), up 17% from 2009 and biofuels contributed 2.7% of the world's fuels for road transport. Global ethanol fuel production reached 86 billion liters (23 billion gallons US) in 2010. The United States and Brazil were the world's top producers and together produced it for 90% at global production. The world's greatest biodiesel producer the European Union, accounting 50% of biodiesel produced in 2010 . For reduce the dependence on petroleum and coal, the International Energy Agency has announced that biofuels distribution have to meet more than a quarter of world demand for transportation fuels by 2050. 1. Vegetable oils and Animal fats. 2. Used cooking oil or waste oil. Below the crops are useful to the production of biodiesel or biofuel from Agriculture fields: Soybean, Corn, Sugarcane, Sugar beet, Switch grass, Jatropah, Camelina, Algae, Cassava, Palm oil, Certain fungi, Animal fat. There are number of forms of biofuels having detailed process of various stages. The animal fats, vegetables and oils consists called triglycerides. In the process of production of biofuels, all the fats and oils will be converted into esters, separating the glycerin. At the final process, all the glycerin settles down at the bottom and the biofuel will be stayed up. The process through glycerin is separated from the biodiesel is known as trans-esterification. Some of the chemicals have to use during the manufacturing of biofuels with ethanol or methanol. Methanol is departed from fossil fuels while ethanol is derived from plants which are given as Figure 2. Figure 2. Fuels from biomass. 1. Filtering: Here, the wastes from oil crops have been separated to takeout husks and produce liquid item. Further, process undertaken to give little hot subsequently, it has to be filtered by coffee filter. 2. Removing of water: Water contained in residual gangue has to remove to seek reaction quickly. Find the stream of water it be heated at 100° Celsius for some times. 3. Titration: In this process, determines the amount of lye which required to produce biofuel taking place vital and it is most important and crucial for the purpose. 4. Preparation of sodium methoxide: Here, methanol has to mix with sodium hydroxide to create sodium methoxide. Mostly, the quantity of methanol used is generally 20% of waste vegetable oil. 5. Heating and mixing: The residue is heating at 120° to 130° after mixed well. It must be maintained for the process should be done well with avoiding splashing of the liquid. 6. Settling and separation: Subsequent of mixing the liquid, it should be leave to cool down. After the cooling process, the biofuel will be appear as floating at the top while the heavier glycerin would be found at the bottom. The glycerin can be easily separated by allowing it to drain out from the bottom. The person is left over with pure biofuel which can be used for various purposes. Using fuel for automobiles, trucks, and possibly planes as liquefied type is preferable to ensure performance well. But, the concept is whether the production of fuel to distribute all is enough or not? One side production of biofuels is enhancing and other consumption of this has been wider especially, biofuel energy needs from home heating from vehicle fuel to electricity generation. So finding the needs of major uses in different sectors which equips the economic development is most prior in biodiesel energy use. 1. Transportation: 30% of all energy have consumed in the United States for transportation purpose and this shall be equip up the purpose of the same in agricultural field also to transit yield to different places after it collected. 2. Power Generation: Generation of electricity is a tool for economic development and determines the nation that has attained development or growth. In 2008, electricity produced about 20,261 THz 41% of that energy drawn up from coal, 21% taken from natural gas, and remain was covered by hydro, nuclear, and oil at 17, 17, and 5% respectively. 3. Heat: The majority of biofuel used in heating of solid materials in various activities. Wood is both an aesthetic and a practical format of heating and huge number of homes use wood burning stoves as supplements to other heating systems like natural gas or electricity. The renewable energy biomass is also a source of electricity production but not up to fulfillment of requires, up to manage and adjust with electricity consumption in various fields . By the direct combustion of biomass material such as agricultural waste, woody materials and others have potentially to generate electric power at direct-fired combustion system in most bio power plants. Moreover, production of electric power by the combustion of one ton dry wood chip can expose one megawatt-hour of electricity which is given as Figure 3. Figure 3. Electricity from biomass. 1. 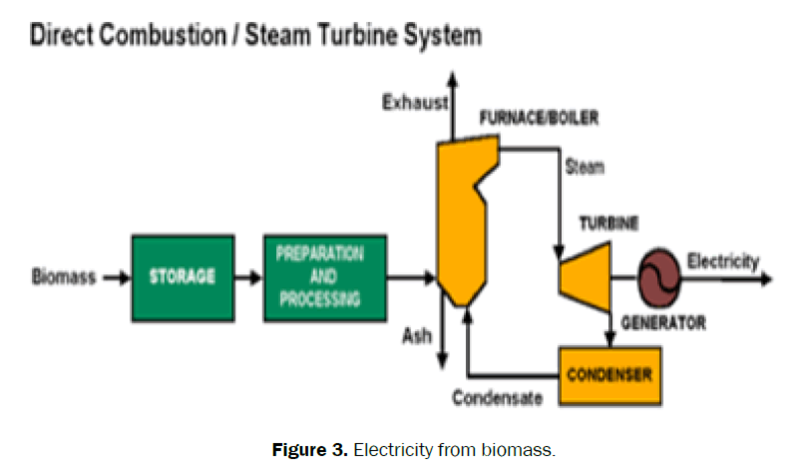 Heat: The required biomass material need to combustion in heat water up to steam becomes and transits it to steam turbine. 2. Gasification: With the use of dry biomass gasification process have to undertake until become it as wet biomass with silence of oxygen . It produces synthesis gas (CO+H2) known as pyrolysis of biomass. The wet biomass such as food waste, manure turns into methane (CH4) in digestion tank and both methane and synthesis (syngas) may use in gas engine for further steps. 3. Fuel cells: After complete the process of gasification; it should be send to fuel cells which can be generating electricity. Purity of biogas is prior one lest damage the fuel cells . Biofuels, like ethanol, biodiesel and bio-oil which has produced from biomass are can be work as tools for electric power production. Biomass is an energy which helps to generate electric power by undertaking various processes and this consist number of types which exposing effective potential to produce the same . Above table shows statistics of future assumption of biomass potential in three categories namely, realistic, optimistic, Suspicion and each points the year classification from 2010 to beyond 2020. Given data have been appearing in growing trend especially, contribution of agro-potential is great while fruits provisions are less among others and under urban wastes, Municipal solid wastes have huge efficiency to generate power in present and future . This paper has been revealed the significance of renewable energy biomass in agricultural field to produce major commercial energy. Agriculture ruling as an important sector in developing countries like India but lack of ideas in promoting of particular crop which equips the economic condition is one of cause to identify drawbacks. Thereby, outcomes from agri-field including or excluding of crops, need to consider for further purpose to rest or out of agricultural activities. So the alternative efforts required to enact the purpose utilization of biomass in enhanced agri-field. Importance of biomass production and potential for future energy productivity on development of agri-field has brought out with various procession of biomass interaction and efficient itself. If the agricultural field tries to enact various energy production programs with the help of biomass utilization and can be save much use of commercial energy which has paying high price for consumption. 1. Biomass (crops grown for the purpose of fuel): 40,000-100,000 gallons for produce per megawatt-hour. 2. 2.69 kg of corn grain supports to produce 1 L of ethanol. 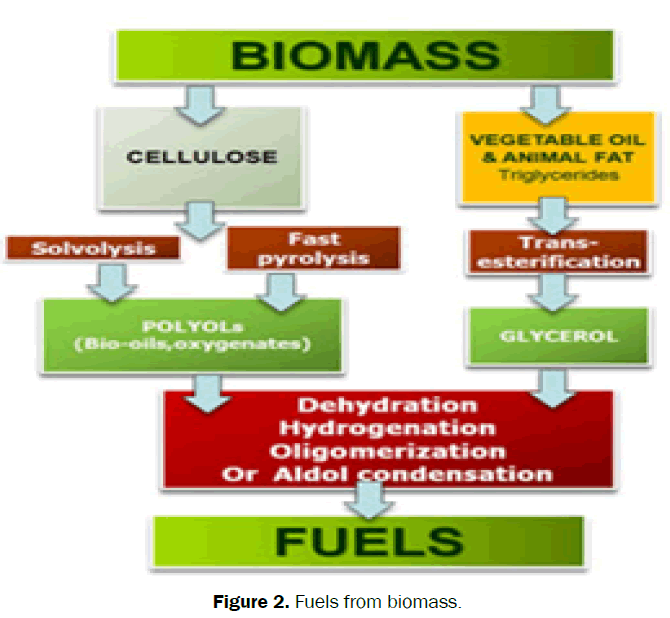 (Dr. Mae-Wan Ho (2010) 'Biofuels Waste Energy to Produce', Institute of science in society. 3. One tone of wheat requires producing 400 L of ethanol. 4. 3 m2 of land growing wheat is need for produce 1 L of ethanol. As recommendations for further research on specified problem with alternative interactions may effective one for policy execution and to limits the unnecessites. Thereby, this study has exposed some of suggestions to spur the Indian Agriculture unto economic development. 1. Awareness should be produced among farmers to do not miss use the agricultural wastes and transit to useful energy. 2. Incentives need to increase for commercial energy production from biomass. 3. Feasible technology must be introduced to rural and backward areas for energy productive purpose. 4. Government interaction should be on the production of biodiesel and electric power from biomass. 5. Agricultural wastes require using as new energy source. 6. Biomass energy product must be executed in agricultural fields. 7. Alternative commercial energy sources need to cultivate in agri-field. Biomass is renewable energy have been pumping from agri-field after the reaping of kinds of crops and some of them have cultivating as main crop in few areas especially where the scarce of technology prevailed . This is common that everywhere happens but the matter is that the agricultural technology is promoting wastes to be alternative source or not? This paper has brought out various aspects of biomass and it's potentially, production in the generation of some commercial energy along with statistical information of biomass as Indian state level. Finally it pointed the incentives for biomass production based on the various Indian regions and effective suggestions also mentioned for the boost of Indian agriculture . Forest Energy Forum. Newsletter. FAO: Rome. 1991. Conference on the multifunctional character of agriculture and land. Masstricht: FAO/Netherlands. 2001. Schnepf R. Agriculture-based renewable energy production. Congressional Research Service. 2006. Joshi P, Sharma N, Sarma PM. Assessment of biomass potential and current status of Bio-fuels and Bio-energy production in India. Current Biochemical Engineering. 2016;3:4-15. Energy Technology Support Unit. New and renewable energy prospects in the UK for the 21st century-supporting analysis. UK Department of Trade and Industry, London. 1999. Topical Repot. Renewable Energy Technology characterization. US Department of Energy, Washington, USA. 1997. Ugarte DDLT, Walsh M, Shapouri H, Slinsky S. Growing energy on the farm: biomass and agriculture, the economic impacts of bioenergy crop production in U.S. agriculture. 1999. Energy Alternative India. Biomass to power. 2012. Gupta A. Biomass sector in India–problems and challenges. BioEnergy Consult Powering Clean Energy Future. 2015. Energy Alternative India. Potential for biomass power India. 2012. BISYPLAN–The Bioenergy System Planners Handbook. 2010. Maehlum MA. How Electricity is generated from Biomass. Energy Informative the home owners guide to Solar panels. 2013. Energy Alternative India. Government incentives for biomass power projects. 2012. Ho MW. Biofuels waste energy to produce. Institute of Science in Society. 2010. Randy S. Agricultural-based renewable energy production. Congressional Research service (CRS). 2006. Matthew A Brown. Introduction to renewable energy technology. A Year-long Science & Technology Course. 2008. U.S. Department of Energy. Biomass for electricity generation. Federal Energy Management Program (FEMP). 2011.